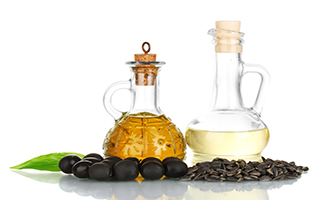 Olive oil or sunflower oil — which is better for your skin? You know I like to use natural ingredients in skincare products. But just because something is natural doesn't always mean it's the most effective option. All of the ingredients in Système 41 have been thoroughly researched not only by me but by our chemists and researchers to ensure we've selected the cleanest and most powerful options. I'm always glad to encounter research backing up our choices. One such study was published in the journal Pediatric Dermatology. For this study, the researchers investigated the effects of both olive oil and sunflower oil on the skin. Both are natural oils known for having healing benefits. But which is better? The researchers wanted to find out. The researchers started by placing 19 adults into two groups. One group applied six drops of olive oil to one forearm twice a day for five weeks. The other group did the same for four weeks, with the addition of applying six drops of sunflower seed oil to the other forearm. The researchers then evaluated the skin of the participants. Those who used the olive oil actually experienced a reduction in stratum corneum integrity and an increase in mild erythema, or redness of the skin. Erythema is associated with inflammation. Those using the sunflower seed oil, however, had preserved stratum corneum integrity, no erythema, and improved hydration. The researchers concluded that repetitive use of olive oil actually damages the skin barrier and can cause or exacerbate atopic dermatitis. They recommended that olive oil be avoided as a skin treatment product. Sunflower seed oil, however, was not harmful and was actually beneficial. That's why we included it as one of the first ingredients in Système 41's Night Treatment. It will help keep your skin barrier intact while locking in the moisture you need to maintain a youthful, healthy glow. Interestingly, researchers have found that bixin can have the opposite effect in rodents. No bright-red sunburns for them! When they injected mice with bixin and exposed them to UV radiation, the bixin mice showed much less severe skin damage from the sun compared to the control group. The bixin also seemed to help prevent skin cancer, not by killing the cancer cells but by stimulating the mice's own cells to protect themselves through antioxidant activity. The cancer cells never even had a chance to form. The researchers are planning to design further trials to investigate bixin's effects on humans. They're hoping to determine whether consuming foods with added annatto can help prevent sun damage and even skin cancer. Right now, you'll find annatto in everything from cheese to cereal to sausages. Many of the foods that annatto is used in, such as baked goods and potato chips, aren't particularly healthy. Please don't stop wearing sunscreen just because you see annatto on an ingredients list. But if you do spot it, now you know what it is. However, to have a significant sunscreen effect, you would need much more than the bit of bixin found in cheese or chips.